Welcoming a baby into your life is a miracle … and the start of a challenging adventure. Moms want the best for their babies and want to know they’re doing a good job. But they’re faced with a multitude of nutrition decisions every day, bombarded with conflicting and often confusing information. They have to make decisions with their minds and with their heart on a daily basis. Not all baby food is created equal. 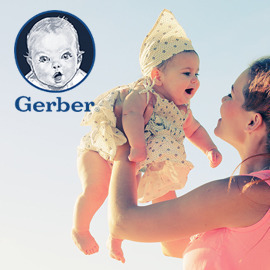 At Gerber, they’ve always believed that little ones deserve high standards, and they understand that Moms only want to feed their babies the very best. Can you bring Gerber’s proposition to life through a powerful ad that connects emotionally with moms? Create a print ad that wins the hearts and minds of mums to convince them to buy Gerber Organic baby food. FORMAT: Print ads, visual and text (1 page PDF for poster + 2nd page for description). Send your entries before 3rd June and win up to €6,500!